SIBANYE-Stillwater is to ask the Labour Court to declare a four-month long strike at its South African gold mines by the Association of Mineworkers & Construction Union (AMCU) unprotected following an audit of union membership that shows the firm’s three-year wage offer accepted by certain unions last year was a majority decision. The way is now paved for Sibanye-Stillwater to extend the wage agreement to AMCU in terms of the Labour Relations Act (LRA). Unions including the National Union of Mineworkers (NUM) agreed in November to an increase in the basic wages of category 4-8 surface and underground employees at the gold mines Kloof, Driefontein and Beatrix of R700 in year one; R700 in year two; and, R825 in year three. The NUM, as well as UASA and Solidary, also agreed that miners, artisans and officials would receive increases of 5.5% in year one and 5.5% or CPI (whichever is the greater) in years two and three of the wage agreement. The agreement was rejected by AMCU even though it had participated in the negotiation process. Now, the union, which is at loggerheads with Sibanye-Stillwater on several issues, including its proposed takeover of Lonmin, is to contest the verification exercise completed under the auspices of the Commission for Conciliation, Mediation and Arbitration. “AMCU has again challenged the outcome of the verification exercise and we again urge AMCU leadership to allow due processes to be followed in the interest of a peaceful resolution to this strike,” said Neal Froneman, CEO of Sibanye-Stillwater. The violence has been so bad that South African police minister, Bheki Cele on April 3 said his department had launched a crime combating drive focused on Blybank, an area near Carltetonville that had been especially affected by the AMCU strike. Froneman sounded a defiant note, however, saying today that: “Irrespective of the court outcome, we will not entertain a revision to the wage agreement or any other type of settlement that undermines our other stakeholders”. Speaking at the annual Breakfast Indaba in Johannesburg on March 27, Froneman said he was not intimidated by AMCU despite the violence which has resulted in the loss of life of union members, and destruction of mine and employee property. “Joseph calls all the shots. I don’t understand how an organisation that is supposedly democratically run operates like that,” Froneman said, adding Mathunjwa appeared to have a “political” agenda given his strident criticism of the ANC and government. South Africa goes to national elections on May 8. This has become the biggest joke for the mining industry of late. These clowns have no idea what they want, getting some willy nilly legal advise and then thinking they will get away with it. Now amcu are unhappy because they are not allowed a dispute resolution during/after the verification process. AMCU members left everything behind and are on a protected strike and are not being paid, so how is AMCU killing the mining industry? NUM members and according to the company they are the majority so they should give the company the production. It seems that everyone is caught up in only describing and debating the situation at face value. Only the usual suspects are mentioned, AMCU, Sibanje-Stillwater management and the shareholders. The long term destruction of the SA Gold mining industry is not by chance. 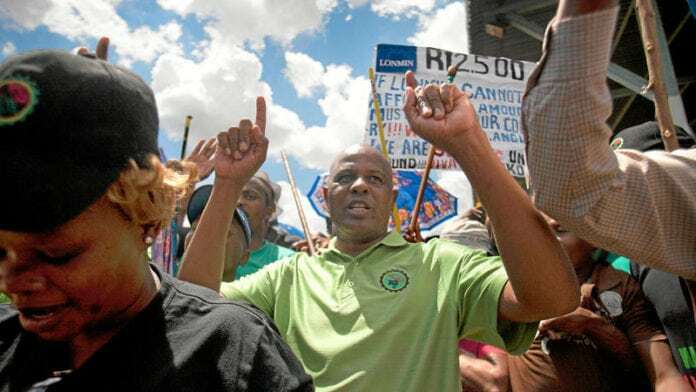 Identifying motive requires examining the situation at a far deeper level than the meagre benefits that players such as AMCU may be aiming for. Howdy – Go on, if you have the time and inclination. What’s your view on the trend? Why are SA gold shares at or below 2005 prices, when gold in ZAR has increased by 700% since 2005 (e.g. Harmony 2005 – R36.50. Harmony 2019 – R27)? 2005 – R2500 per ounce. 2019 – R17500 per ounce (700% increase). Labour cost increase in ZAR, 2005 to 2019 – 200 – 250%? Only vague explanations are provided in order to justify the above, usually with references to declining grades, rising costs etc. but absent of real hard data to support. Perhaps an article with analysis of this margin/value erosion over the given timeframe together with detailed supporting data would be interesting?